Dr. Cheng Zhang, assistant professor of chemistry, has been working on a project to convert carbon dioxide, a greenhouse gas, into value-added chemicals and fuels like ethylene and propylene. “As the concentration of CO2 increases over the years, it’s really caused climate change, including global warming,” Zhang said. Zhang has been working with five students on this project: David Triger, a senior nutrition and dietetics major; Laura Bogen, a junior music major; Alexandra Leichman, a junior forensics science and chemistry student; Keolani Williams, a senior forensics science student; and Jiao Luyun, a senior chemistry student. Zhang wants to convert methane into methanol, a process she says will be significant to the society. “Methanol is a very important raw material also for many industrial processes. So in some industrial process to make ethylene and propylene, they use methanol,” she said. Other projects include a paper on converting biomass and waste material into fuels in order to provide sustainable energy. This paper, “Essential Quality Attributes of Tangible Bio-oils from Catalytic Pyrolysis of Lignocellulosic Biomass,” is published in the Chemical Record Vol. 19 in March 14, by the Chemical Society of Japan. 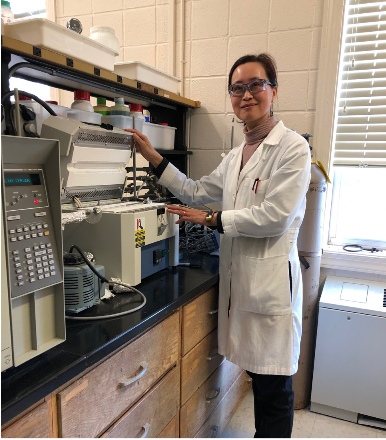 Zhang submitted an article on an industrial separation process she co-authored with Dr. Nicholas Ramer to the Journal of Chemical Thermodynamics on March 21. “We tried to use ionic liquid as a solvent to use in a separation process,” she said. Her unique approach is using green solvents. Ionic liquid is not as volatile as the organic solvent currently used in the industrial process and is thermodynamically stable. Her process works through the use of a catalytic approach. “We develop catalysts in a lab and the catalysts can efficiently convert CO2 or methane into ethylene or propylene. The process is simple and also very unique in converting waste material into more valuable materials. We turn waste into treasure,” she said. Zhang loved chemistry in high school, and decided to pursue a chemistry degree at the China University of Petroleum in East China. She then came to the United States to complete her Ph.D. in chemistry at the Hunter College of the City University of New York. Zhang did not immediately go into academia, and instead worked in the field. After graduate school, she worked as a senior chemist and project leader for more than 10 years with the R&D center of Headwaters in Lawrenceville, NJ, for Celanese in Houston, TX, and for Scientific Design Company in Little Ferry, NJ, before she joined LIU Post in fall 2015. She has also been an inventor /co-inventor on 35 patents in the USA, South Korea (KR), China (CN), the European Patent Office (EP), and the World Intellectual Property Organization (WO). Professor Cheng Zhang with catalyst testing flow bed reactor. Her inspiration was partly due to her acquaintance with Dr. Stuart L. Soled, a distinguished research associate at ExxonMobil Research and Engineering Company and a fellow of National Academy of Engineering. Soled told her, “Knowledge, when you share with someone and have impact on someone, [is valuable to yourself].” Pondering this, she believed the scholar and student connection would positively impact society. “Those words really hit me at some point,” she said. Zhang believes her experience in industry helps her connect with students in the classroom with the real world application. Her work involves solving practical issues, such as how to convert carbon dioxide into sustainable energy. Every semester, five to ten students join the project for credit. Zhang’s students are from diverse majors, including music, nutrition and biology, forensic science, and math. They take an interest in the practical possibilities of science, and she introduces them to the lab that she had built. As part of her project in converting chemicals into sustainable energy, she explained the connection between carbon dioxide and the materials we use (clothes, computers, smartphones) and expressed the project to them in terms of solving a problem for real-world purposes. She also showed them how to create a catalyst. The simplicity of the process amazed them, she said. This summer Zhang will mentor four students from the Brookhaven National Lab, two from the visiting faculty program (VFP) and two from the science undergraduate laboratory internship (SULI). The VFP program intends to increase the research competitiveness of faculty members and their students from historically underrepresented colleges, while SULI program are placed with members of the scientific and professional staff in order to gain research experience in areas such as chemistry, high and low-energy physics, nuclear medicine, and applied mathematics. Three of the students will be from Zhang’s research group. Students in the program will have access to the full range of facilities in the national lab, and can interact with scientists in the lab, according to Zhang. They can also get a $5,000 stipend during the 10 weeks from the Department of Energy (DOE).